FC Barcelona and Girondins de Bordeaux have reached an agreement for the transfer of the player Malcom Filipe Silva de Oliveira. The operation will cost 41 million euros and 1 million in variables. The player will sign with the Club for the next five seasons, until the end of the 2022/23 season. Malcom will arrive in Barcelona on Tuesday and will have the traditional photo taken by the Club badge outside the Club offices at 8.00pm CEST. The Brazilian player will undergo a medical on Wednesday morning before joining the 2018 FC Barcelona US Tour sponsored by Rakuten. Born on 26 February 1997 in Sao Paulo in Brazil, Malcom Filipe Silva de Oliveira, better known in footballing circles as Malcom, is an attacking player with a great future ahead of him. He stands out due to his electrifying pace and his technique with the ball at his feet. He signed for French club Girondins de Bordeaux at the age of just 18 after having won the Brazilian title with Corinthians, the club where he began his career. 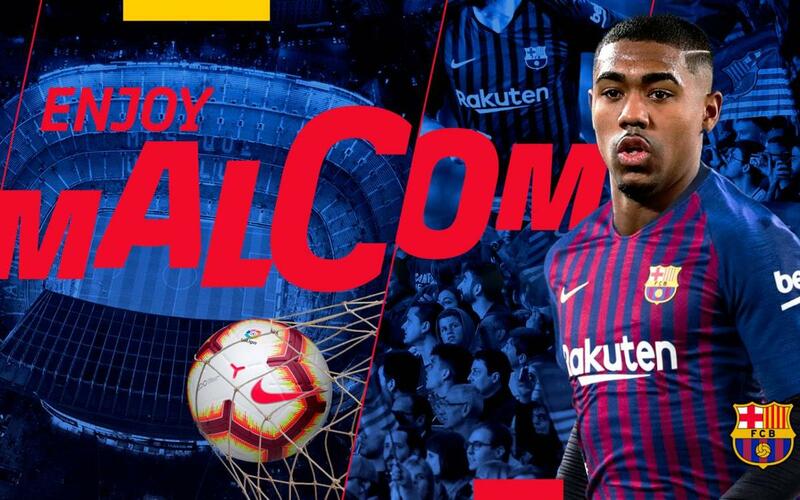 Malcom is a daring, pacey forward with an ability to shoot from distance. Despite being left footed, he is no slouch with his right also and can play on either flank. He has mainly operated on the right hand side so far in his career to great success, attacking defenders and getting into the box at every opportunity. Aside from his speed, he also has great technical ability and links up well with his team mates, one of the main aspects of Barça’s football. The Brazilian winger began his footballing career at the age of 10, joining the youth set up at Corinthians. After moving through the various age categories at the club, he made his debut for the first team in 2014. A year later he claimed the Brazilian league title with Tite as coach. His performances drew interest from European clubs and he made the move to Girondins de Bordeaux where he played for three seasons, making a total of 86 appearances, scoring 19 goals. Furthermore, he has represented Brazil in several youth categories, forming part of the squad that was runner in the U-20 World Cup in 2015.